Is your mortar dry and your tile firmly in place? If so, then you're ready to start grouting. Once your mortar is dry and your tile is firmly set, remove all of the spacers. Refer to your grout’s packaging for complete mixing and application instructions. Then, use a mixing attachment on a variable-speed drill at low speed to mix the grout according to the instructions on the packaging. If your tiles are stone or terra cotta, wet them before grouting tile floor. Apply th e grout with a grout float, working the grout into the narrow spaces and filling all the joints completely. Work at your own pace and direction that seems natural to you. Holding the grout float at a 45-degree angle to the tile, move it diagonally across the backsplash. Don't be afraid to really pack it into the joints. Many people find it easiest to pack the grout into the joints using the small end of the grout float, rather than the long edge. This method works just fine, but remember to use the long end of the float to scrape off excess grout after the joints are filled. If you have excess grout, scoop it up or scrape it off into the bucket. Let the grout set according to the instructions on the grout packaging. If you think it's set, touch the grout with your finger. If no grout sticks to your finger, then immediately begin the next phase of grouting. After the grout sets – typically for about 10 minutes – you’ll need to begin cleanup. Slightly dampen a large, small-pore, synthetic sponge. The sponge should not be wet, so make sure you wring it out well. Lightly wipe the sponge across the tile surface, avoiding removing too much grout. Also use the sponge to smooth out the grout joints. If grout pulls out of the joints, you need to allow additional setting time. Clean the sponge frequently, and wring out as much water as possible each time. Replace the bucket of cleanup water often. If too much grout is removed, then pack the grout into the joint again and let it set once more. 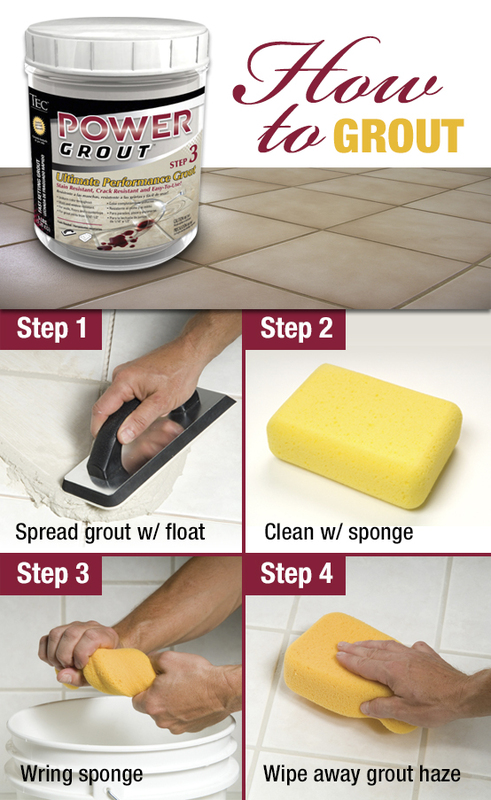 Wipe away any remaining grout with the sponge and let the grout cure for the required time. Refer to the grout packaging for appropriate cure time. Some grouts, like TEC Power Grout, are fast setting and allow foot traffic in four hours. The last step of a floor tile installation is to caulk the tile floor. Can you mix the TEC color mix with the Keracolor Sanded Grout? Hi Tracy, Are you referring to the TEC Skill Set DesignColor Grout color mix cups? If so, we don't recommend mixing this with Keracolor sanded grout. It should only be mixed with the TEC Skill Set DesignColor Grout Base. After grouting a floor with 13 inch square tile I noticed hair line cracks in the grout running the length of the tiles. Is this normal or should I remove the grout and reinstall. It happened within a week of grouting the floor. I used "Premixed Grout 945 Light Buff. The grout seemed a little dry coming out of the tube but seem to go down OK.
Hi! The hair line cracks may have resulted from the grout being a bit dry. We suggest to skim more grout over the areas where you have hair line cracks as the TEC® Premixed Grout adheres to itself in a thin application. We invite you to call our technical support hotline at 1-800-832-9023 for additional support.